Perhaps one of NBA teams such as Toronto Raptors, Philadelphia 76ers, and other playoff contenders will consider signing up Jeremy Lin if the Hawks buy out his contract. Lin’s agent will continue to talk to teams that can benefit from his services to advance deep in the playoff, perhaps to reach the NBA Finals. Until then, let’s celebrate something special when the undrafted Jeremy Lin came out of nowhere to shock the NBA Champ in 2012. Clyde and Spike Lee are both on record saying the loudest they've ever heard the Garden in their lives was during Linsanity. Seven years ago today, Jeremy Lin dropped 38 points on the Lakers. just to carry over from the previous thread: my son will be at the game in atl tonite. he sez gordon may not play for magic and collins possibly out for hawks. and he promises me reports. i dont usually try to post during games things go to fast but ill summarize anything live on the scene reporting brings later. i think its not that often this board has someone actually at a game; he was surprised by that. that there would be so many “lin fans” who actually have never seen him play. anyway. later. from an on scene reporter. you’ll hear it from moi. right here. Thanks for being a secondary live reporter 🙂 Props! This is it! Go go go! No picture or autograph from Lin? Have you guys ever seen this Hawks team promo, played at intros? Thought pretty cool, well done. Orlando is 2.5 games out of playoffs, must also get ahead of two teams. Wiz and Pistons. So is Orlando trying to win now? Or gave up by trading for Fultz. Rumor has it they also tried to get Frank Ntilikina from the Knicks. Doesn’t sound like win-now. They run that play from Lin to Bembry, out of time-outs, quite a few times. Works great. Bembry got hops. Don’t know why he’s not good at finishing layups at the rim either. Lin’s floater. He seems to be indecisive whether to pass off to Len or shoot it. But good that he’s not charging into multiple defenders. Lin, u can do a lot better than this. Let’s go! Tough play. Orlando had numbers. Could have waited. As soon as he gets back on court. Haha. Even Wilkins and Rathbun seem tired….lol…. Basketball fans don’t care about defense just whether they can shoot. I hope lin finds a new team soon. no lin news from the scene sorry to say but my son did high five with vince carter as he was leaving the court. actually i saw him (my son) not at that moment but at the railing there where the players were going out. i thought it was him and then when he told me slapped hand with vince i knew that was him then. actually ive seen him on camera on tv at sports events several times. (not vince carter, my son). there dorothy and lin the zone there’s yer lin. Jeremy, go go go !!! Keep scoring! U know what to do! So rare to get someone from this board live at a game. Personally, I hope bench doesn’t try when they get in game, because even if they claw Hawks back into game with tremendous defense, they will all get pulled in fourth quarter so Trae can get credit for their hard work. Let Schlenk reap the culture he has built. Wilkins and Rathbun couldn’t stop praising Augustin. How he’s controlling the tempo of the game, getting his teammates at the right places, all those assists. Lin finally hitting his 3s woot! Don’t care. As long as Lin gets playing time. AND STATS! Lin got hit on that play, should’ve been offensive foul! LEN dribbling and dunking! That’s the way to do it! Len mad! Making a 3!!!!! Give this group props. Working hard…too bad Hawks down 23. Meh. Wow Len actually made a 3, goes to show, shoot it enough in game you’re bound to start making them. No one cares. Lin just needs to get out of this slump and Hawks will shove Trae aside once they get their real franchise through drafts. Argghhh – in and out! And then a blocking call? Dumb refs. Lin – stop taking those contacts! Come on Lin, stop taking those dumb charges! Orlando just making everything. What are you gonna do. Even though this Hawks group playing much better defense. Lin when over to slap Baze’s hand for the 3 pt pass haha, love it. Gosh Bazemore is a great teammate, wish Lin x Bazemore can be the cornerstones of their own team! No jealousy, no ball hog, great defenders and shooters! Please let it happen next season! Holy smokes! Len just became Lopez!! two 3s made this game! Gotta watch out for the cheating Refs. Lin has 3 fouls. Brembry always has those dumb fouls not a great defender. Get both Lin and Bazemore off this team and team up somewhere else! Were they Lin assists? Missed that part. Wish that one went down. Rolled around the rim and out. Bazemore getting $19M (player option next year). Don’t think he plans on going anywhere. Unless Atlanta trades him next season. Shouldn’t have taken that charge, refs always cheats him on those plays and it ruins his back. Just stop taking them not worth it! Ref trying to make Young a star? So …. no more Lin ??? Quite possible with them rebuilding but yes Baze won’t give up on 19Mil when he’s not starting nor getting the opportunity to get his stats for a big contract. But if Lin finds a new home as starter 1 year after maybe they can reunite again. Bazemore is the best and most efficient SF/SG Lin’s played with, no.2 would be Nick Young but not as good as Bazemore. Imagine having Lin, Baze, and Young as starters on the same team those are the type of teammates Lin needs. Legit scorers, no shot chucking and never jealous of him. Happened to Harden and Walker, it can happen to anyone so long as they shoot enough, defense doesn’t matter. Come on coach, play Lin now! Trae playing horrible, missing everything and horrible layup, what was that? Hawks are doomed. Huerter at most is a role player, no way will he become anything like Thompson. Exactly why the NBA has fallen into non competitiveness, GMs and scouts have too much bias and will hype up their chosen ones even if they’re wrong. Especially with the Refs help….. Enough already, blow out is sealed bring back the bench lineup this is a brick show and boring as heck! Why would anyone buy tickets to watch this crap? mid range was wide open, wish the 2nd one went in too. Defenders are too used to guarding 3 or layups nowadays that they forget about the mid range completely. Jeez. Wilkins and Rathbun CAN’T STOP saying how good he was tonight. See that, luck too. DJA always outplayed by Lin. I remember Lin posting him up and made him look silly. Has been backup since 2012. Now starting on a possible playoff team. hawks just cruising till the last game..no energy and can feel the disappointment in jeremy’s way of playing…less energy and lack of eagerness to win…contagious and hope he doesn’t hold this till next season! confidence given by the coach, thats why. Of course, it’s obvious the Hawks are development tanking with rightful players like Baze and Lin benched and disrespected! One thing to develop but Lin and Baze should be starting. Yeah. Amazing that Clifford has no problems with him. Guess he loves the “no turnovers”. No point in trying to win tonight. No need for Lin to go all out. The Rookies are probably burnt out. Played a lot of minutes. ALso probably distracted by Young and Collins with all the All-Star stuff. Overconfident. rookie starters were all playing selfish and for themselves, chucking bricks left and right including Huerter! Young, Collins, and Huerter all enabled by coach to go iso and for their own shots. You see Huerter never passes back to Lin for open shot. Right now the only one willing to look for Lin’s open shot is Bazemore! Even Len doesn’t make the extra pass to Lin for a better open 3.
well we know Lin likes to win everytime comewhat may, but i am not liking his looking at the game today..no will! (and its not because of rhythm or playing time or whatsoever) Lin even in losing as the WILL to win , but right now, its gone! i don’t mind other players doing what you are speaking of. What i saw was Lin no WILL to play and Win! lol I saw your comment while watching so I tuned back in thanks. what i am talking about is NOT about winning or losing a game, its about the Will to win..on LIN its gone on this game. Coaches too, blinded by bias of what they think a starter or star player should look like instead of the abilities shown right in front of them. There’s no reason why guys like Yuta are getting scrap or 0min games when all these starters in the league look like 3rd stringers. it doesn’t matter for the coaching staff and the FO doesn’t look at it the way its supposed to bring on the table..theres no remorse on those young player whether they palyed bad and not the right way because their head doesn’t hold them accountable. Lin played hard today and got going, much better than previous games and shows he’s getting out of the slump. Lin wouldn’t have taken the charge if he wasn’t playing hard, in fact he defends and plays too much defense. I can tell he’s learning to balance out and lay off at certain points to save energy. No star player can play hard defense or fast breaks all game and still have legs left for shooting. Lin needs to watch Yuta Watanabe’s games, he knows exactly when to switch gears and lay off on defense and not over help, while still blocking shots and double teaming, also cruises pass half court most of the time. He’s been like that every game you can tell when he chooses to drive against double team or defender instead of passing to Lin for open 3. Lin shoots better 3 Pt% when contested. Funny. Not when wide open. Like he just lets it fly when contested…wide open thinks too much. again i am not talking about the manner of his plays but his WILL to play it..well maybe its hard to see what i am seeing because i don’t mind the winning and the losing also, and thats what i saw with Lin,…he doesn’t mind losing the game NOW. Well Hawks are tanking and starters were playing selfish and dug a blow out. With those limited minutes, no way should Lin go out all but he played hard D and got 12 pts it’s enough. I noticed he drove to the basket less which was good to see. not enough shots, even during garbage time…LOL! Don’t worry, Lin will NEVER NOT enjoy playing, or winning. Maybe he’s looking forward to all-star break too. Exactly why he should become an off dribble 3 point shooter. Exactly no competitiveness or shame in losing, that’s what it’s like to be entitled. Can’t wait until these wannabes get a wake up call cause Huerter, Trae, and Collins are not stars. Sorry can’t remember probably not but Lin’s insist on passing to Len for open 3s definitely paying off. If only Len did the save for him. If he’s still with the Hawks. It’s the usual 18-20 mins, the usual 7-9 shots. I think that’s all he will probably play the rest of the season. I mean, it’s the second night of B2B, and he didn’t get more, so….. There are 7 more games before the March 1st buyout deadline. And only 2 more games before the All-Star break. Sport, you need to buy a team – then you can put together the team of your dreams! LOL. Kidding…. You should play NBA 2K…..
FYI – Just looked up the replays on NBA.com. Both Len 3’s were Baze assists. i watched the entire game and saw some cruising along the way..not the typical Lin i watched before..
Like I said, they don’t treat players as people. Just “assets” and “liabilities”. We will see what this team is made of when Lin is gone. ; Not pretty! Okay. It’s one game. He’s not giving up. His latest postgame interview for Lunar New Year with fans. He said he knows 82 games will have ups and downs. That he was in a slump, and “clawing” to get back. So, don’t worry. Serious question. Why is everyone upset with the Hawks? They let Lin rehab after a very very serious injury. He’s getting okay playing time, to get back into playing competitive basketball again. He’s not sitting on the end of the bench. Heck, the Hawks could have waived him after getting him from the Nets. And they didn’t. They respect his character enough to call him a mentor for the rookies. IMO, the Hawks have treated Lin well. Didn’t trade him for some meaningless 2nd round pick. Considering he’s obviously NOT part of their future. What was the alternative? Would the Nets have treated Lin as respectfully? I don’t think so. I think if Atlanta didn’t trade for Lin, Sean Marks would have definitely waived him, just to clear the roster. I don’t think Lin would have gotten the chance to play again. Don’t get me wrong. Now that Lin has shown he’s recovered, it’s time to move on. As long as Lin is healthy, he still have too much to give on the court. And NOT be some mentor playing only 15-20 mins a game. I’m just not as upset with Atlanta. Is it me? Links not working……. The way I see it. As a LOF. Guys like Fred VanVleet, DJ Augustin, are not bad players. VanVleet even has the nickname steady Freddy, and DJA was just praised for no turnovers. No risk. But, also no reward. Are these guys dynamic and exciting and fun? Are they difference makers for a team? I would say NOT. And yet these teams refuse to recognize it. Just caught up on all these tweets from Pablo Torre, and Bleacher Report (again), and Knicks bloggers (again) about the 38 pts Lin dropped on Kobe. This is after all the vids and tweets the other day about the birth of Linsanity and the win vs the Nets. Will we see more tweets again on VaLintines Day? Or on 2/19, the win over the Mavericks? This is almost comical. Why so much attention? I don’t remember this in the other years? Why now? And the timing. Maybe this will WAKE UP the NBA front offices. LOL. Considering the patellar injury Jlin looks pretty healthily. Moves well and a lot without fear and hesitation. Still takes a lot of contact but he knows how to “fall”. He knows he is going to the floor so he prepares himself to fall, which is much different than being knocked to the ground unexpectedly. I know we, or I, only see Jlin in highlights but he looks pretty good. I hope TOR is waiting for him. Could be interesting for us Jlin fans to see Jlin in TOR with Gasol, Kawhi and Lowery. TOR could use him for 20 key minutes per game. If he ends up in TOR he might show good enough to get some more minutes from Lowery and Vanvleet but 20 mins is good in a meaningful game like the playoffs where each play is important. Lin looks good. 2 of 3 from three. Good stat line for 22 mins in a blowout loss. I don’t know what Toronto is waiting for. After All Star break maybe? The Hawks fan site, ‘PeachTree Hoops’ has an article about the pro basketball player Maya Moore, with comments from Jeremy. It’s probably to do with the end of Melo-drama and the lifting of the veil of lies by Dolan/Knicks media. Now it’s wide open for all to see that Lin was the best thing that ever happened for the Knicks and that Melo was the instrument that trashed Linsanity. TOR just swapped centers, a pretty big move. Maybe they want to see how that works before adding another key player though by moving Wright they gave up their 3rd PG. it seems an obvious opening for our guy but we are biased. 30 games to the playoffs so there is time to build chemistry though JLin has never had chemistry problems. Coaches that play conservatively often play not to lose. In the end, they are in fact leading their players with fear of mistakes. The sad truth is mistakes is what creates greatness. Those that dare to fail are the ones to find the prize. 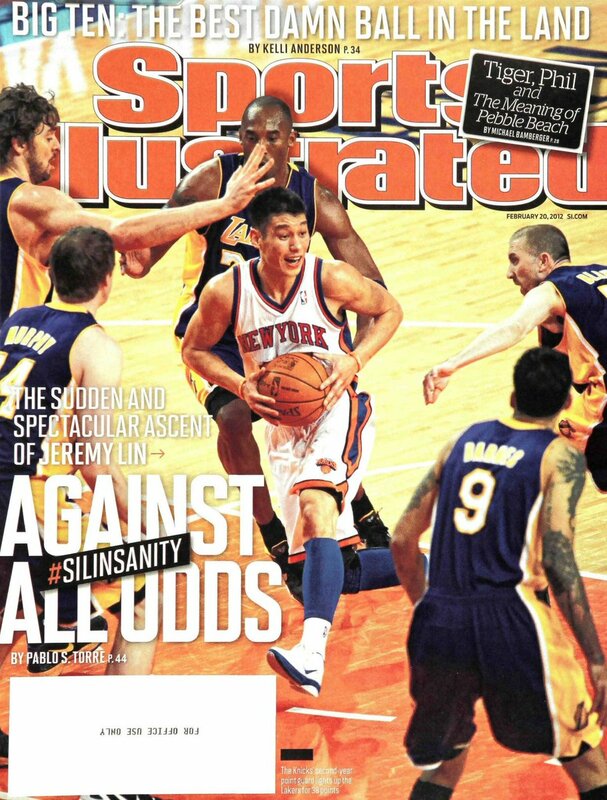 Linsanity was a “feel good” story for a lot of people. Maybe people are trying to relive that feeling of feeling good. The timing is very odd indeed. Perhaps it coincided with Porzingis departure so reminiscing about what Lin did in MSG will bring some sweet memories of what could’ve been? I’m not sure 7-yr anniversary has any significance either. Watch JLin slamming the ball during pre-game routine. New routine? Preparation to do one game dunk when opportunity presents itself? Even though JLin’s 3-pointer has been inconsistent as of late, his 2-point midrange jumper is still reliable. That will be a very useful weapon for a playoff team, as they will be going up against defensive shotblockers at the rim, refs not calling fouls on the drives, and athletic guards and wings defending the 3-point arc. The midrange game is underutilized during the regular season, but it helps open up the floor in the playoffs, and can be that clutch shot when it counts. Reading some of the comments from the time-lines of the tweets. Those Knicks fans, man, they’re all crying into their beers. LOL. Seriously though, we all miss Linsanity. Never has there been a breakout star who got snuffed out so fast. Not because he was a fluke, but because he was TOO BRIGHT!!! Shout-out to your bonsai analogy of Lin! Yes, they’d rather lose with “safe” and “boring” than win with Lin. Who may have a few turnovers, but will bring home a win. Two ex-teams coming up. How poetic would it be if Lin destroys the Knicks on 2/14. Actually, easy schedule coming up. Except for the B2B, right after the long break. And the away at Houston – a schedule loss. All home games too. I think all those teams are very beatable. IF LIN PLAYS MORE. (Not that I’m expecting that from the Hawks.) At least may make it easier to build up some more stats! Assuming Lin gets to playoffs! LOL. Too many teams have bought into 3’s, layups, and FTs. And don’t want players to take them. You are absolutely right! And I’m starting to hear some analysts who agree with you. That it still should be part of the offense, depending on the defense. And Lin has a beautiful mid-range. I miss the 360 turnaround jumper. Haven’t seen it this year. Hope it will come back. But, WOW, more impressive than hanging on the rim. Wonder if his teammates rated the dunk too! Can we say he’s absolutely NOT HURT any more? Lin’s not ready to give it up. I hope I don’t have to hear any more about how Lin should “settle”. Keep the faith JLIN! It’s so great, and unexpected, that Peachtree Hoops would write this article. Several of their writers (not all) have been supportive of Lin. The author obviously follows Lin on social media. Much of the quotes are from Lin’s Prayer Request from last week. But give him credit for follow-up with Lin. What a difference from how horrible Nets Daily was. But, yeah – Especially the RAPTORS – they’ve got roster spots OPEN! Come on Ujiri – step up to the plate! Including me. Even now, seeing these highlights again, still brings a smile! 🙂 Sure would like to see a version of it come back for Lin! Agree – I’M STILL HOPEFUL!!!! Okay, got it. My take-away? Unlike Lin. Trae’s stats are mostly from just the two-man game with Collins. Silver lining to Orlando winning. But too bad Miami lost. Still hoping one of Detroit, Orlando, Miami, or Washington, will knock the Nets out of playoffs. If Hornets can be knocked out too, even better. Where is that “devilish” emoji? These “clowns” – HILARIOUS – several angles of Hawks “bowling”. Wonder which guy comes up with this stuff. Note Justin Anderson at the end. At least JLIN is having fun “on” the court. Haha. Curious – are there any clips of Lin greeting Steve Clifford, pre- or post- game? I know these are included in Speed of Lin highlights. But still fun to see each play separately. The Lob. The Right Corner 3.
for those who missed it in the flow of the game ill update my sons experience at game last nite. he did get some lin interaction at halftime. sent me a text with the caption “linsanity right next to me” and a nice close up pic of lin riding the exercise bike. then also a still from a video of lin running back onto the court at half time. now at the moment i have them only in the texts; have them saved to my phone but cant access them cause of some tech issues. next time i see my son. ill try to get them in a format i can bring them here to post. anyway he did get up close if not personal with lin. and got some nice photo and video of him. as well as talking to and getting autographs from len and collins before the game. and slapping hands with carter on the way out at halftime. ill probably talk with him on phone tomorrow. if he has any other lin related info or insights from the game ill report it. Now there is no doubt that Melo is an overrated trash with the ridiculous contract. JLin is going through a transition period that he needs to change his game because of his knee injury. He has to develop his new game of basketball with his new knee. It is an exploration and soul searching. I would think his transition can use an off season for his adaptation. JLin has already made progress in some of his shots. His transition would be complete in off season. These are delightful videos. The camaraderie he has with these guys must lessen the sting of not playing a lot, especially when he’s been so constructive and positive in his dealings with the Hawks. when he text me “linsanity right beside me” when he sent the pic of lin on the exercise bike which i will eventually try to post here but actually cant even open outside texts at the moment because of technical glitch with my phone lin was there for like 10 minutes right next to him. he said it was really kind of akward; he wanted to say something to him or ask for a selfie pic but he didn’t want to bother him cause he seemed really serious about getting his work in. but as i say he did get a great up close photo and also has video of lin going back into the court and i have a still from that too. also he high five with lin going in and out as well. and the funny part after the game lin didn’t sign autograph except for one little boy but he (lin) was high fiving with everyone and he (my son) had his sharpie in his hand in case to get a autogarph and so when he slap hands with lin he actually accidentally mark him with his marker! anyway hes (my son) so excited.. oh wait i forgot the last bit. theres these little kids beside him after the game and they keep calling trae trae and trae comes over and my son is video taping with his phone and trae passes his shoe right past my son to one of the little kids. so on the video it looks like trae’s giving his shoe to my son!!! anyway as i started to say he’s so excited about all this he cant sleep. well he’ll talk to me more tonight about all this tonight i guess. oh he said lin and the rest of the players dont hang around after the game much; dont look happy any of them about losing so badly. if i get any other lin-formation ill let you know. Wow haven’t seen that in ages. Nice! Our forum used to have people watch Lin play live all the time, but after the 2 years of injury, people stop doing it. Don’t blame them. Most people dont like to watch a tanking team misuses Lin. Glad your son went and had a good time. Thanks for sharing your son’s exciting game-experience. Glad he enjoyed the experience 🙂 I know the predicament to say hi and well-wishes to Lin but don’t want to bother him at the same time. During game time, he can be so focused on the game so you hate to disrupt his concentration. Did your son share the experience of watching Lin in person vs on TV? I have always found Lin is lightning fast in person zig-zag-ing on court making the other NBA players looks as slow as meditating turtle in comparison 🙂 For some reason, TV didn’t quite capture that. It’s quite amazing how quickly Lin had adjusted to his new body coming back from a career-threatening injury. I’m floored to see he dunked in the pre-game practice. You’re right that Lin will leave a void hard to be replaced by the Hawks. Their rebuilding plan to give more and more PT to the young Hawks really conflicted with the need for the vets like Lin, Baze to play in their prime. They could’ve chosen a 50-50 balance but since they didn’t, it’s only right to let the vets play for playoff teams. Good point. Raptors seem better in giving PT to Jeremy. And 76ers has that chemistry issue with Butler and Embiid. As several posts noted last week, Nik Stauskas got traded from Portland to Cleveland, and then to Houston and Indianapolis. All in the space of several days. The Pacers then waived him. Happily, after flying from Portland to Cleveland, he never left because he kept getting told that he might be traded again. Today, he signed with Cleveland for the rest of the year. WISHING YOU AAAALL THE BEEEESTTT! Did you guys notice that Woj learned this from ESPN? I just LOVE how our Lin never bends for the establishment. I am going to buy the tickets when TOR comes to town. Why my eyes are wet. can’t believe it man! first the Berlin Wall and now this! hope coach Nurse will “nurse” Lin back to Linsanity level. go Jeremy! time for you to go get that next contract. Finally, Lin has been release from purgatory. Can someone tell me how to get cheap tickets? I remember I bought some tickets when Lin was with Hornets recommended by someone on this forum. Pleeeease, Lin is coming soon, so I need to buy the tickets. LOL, I remember there was a website where I ordered my tickets last time and cheaper than the ticket price. I just don’t remember where I got them from. next raptors game is Wednesday. then all star break. 9 days off. a game today Lin wont make. Raptors is 2nd in the east. 1 game back. marc gosal is also on the team. Lin will have big opportunity for minutes. will likly start next to van fleet. already averages more then him. also Danny green is the SG averaging 7 ppg. Lin is expected to play a significant role for the Raptors as they replenish their bench after a blockbuster deal with Grizzlies for Marc Gasol. Lin will play minutes a formidable role behind Kyle Lowry and Fred VanVleet. Starting role is not out of the question. All depends on Nurse. Yes, best Chinese New Year news ever! its interesting my son was able to see lin last nite in atl. and get up close photo of him on exercise bike, high five with him (accidentally marking him with his sharpie!) 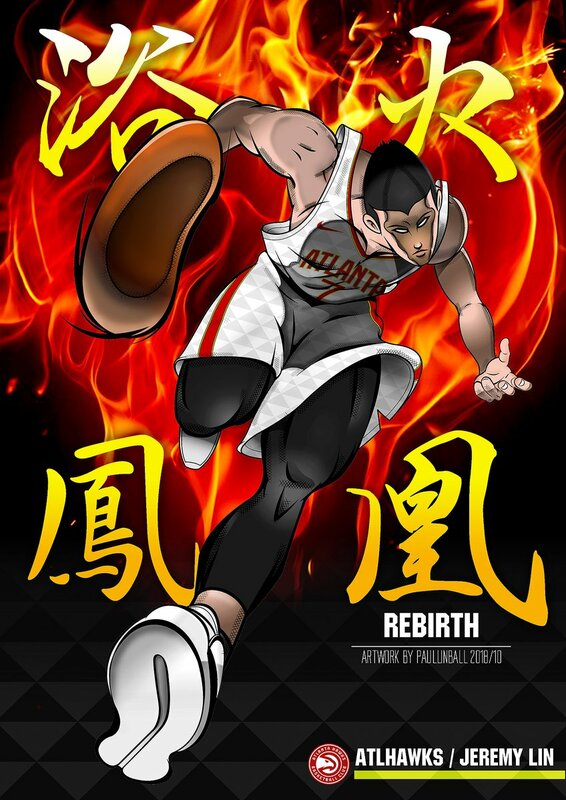 in what will probably/possibly be lin’s last game as a hawk. They got exactly what they deserved….NOTHING! Jlin on Raps???? Dream come true for this Torontonian!!! So it looks like Lin will be replacing Delon wrights role who avg about 18 min a game and taking mins from Van Fleet who avgs 26. So plenty of mins for lin on the raps. or toronto knows how to read…so they waited without giving up stuff. GM Schlep is horrible. Gave up a 2nd round + paid $7M+ for Lin and got nothing back. Definitely did not meet team goals of acquiring assets as he stated. This is amazing, Baze and Lin could not have come from a more different background, yet they are good friends now and you can tell Baze respects Lin whose role was a backup on a tanking team. Extra! EXTRA! Read all about I…. Our hero is going to the Raptors!!! Hope the buyout with Altlanta is going to be smooth one… I feel like I can breath again…almost…LOL. Told ya Lin is gonna to join Toronto, my home town team! Yeah! gsw is enarly invincible.. but the bucks are dam scary..
then you have those annoying nets which they are sliding…still bitter about them. Looks like I’m moving to Canada next. Raptors were going to make a deep playoff run with or without JLin, so main goal right now is to get his rhythm back on Raptors second unit, and not get injured. Think April, May, and June, not February and March. Haters, skeptics, and critics are going to hate no matter what, so hopefully Lin fans don’t create unrealistic immediate expectations where Lin goes all out right from moment he steps on court with a Raptors uniform and ends up with another serious injury. But yes, Lin as the Dragon Slayer in the Raptors for the years to come? Let’s goooo! You got a point. One step a time towards his goal. One step a time. Yes!!!!!!!!!!!!!!!!!!!!!! Finally out of the damn Hawks!!!!!!!!!!!!!!!!! Jewish looks white to me. When will Lin play his first game for TOR? been reading raps realgm reaction and its 97% favorable; and no complaints about lin. only 3% complaints about “crazed lin fans” it will bring. but again that is usually the opposite 97% complaint 3% favorable. but not only are raps fans excited and pleased to have lin they have very knowledgeable ideas about why this is good and how lin could/should be used. for example as i pointed out previously here: the key move was getting rid or wright. wright was the actually back up point guard; yes sometimes van vleet filled that role but when wright was on the court he was the point guard. many maybe most raps fans feel lin will eventually auto fill the backup point guard role that basically wright did (and that lin is an upgrade at that) and van vleet revert more to a scoring 2 reserve (as green the starter is not a scorer; a 3 and d). others suggest lin’s play making abilities will make it easier to move ibabka to the second unit quickly. i didn’t see minutes here while wright was there but now with wright gone. yes lin should get equal or more minutes than he’s had on the season and in a much better atmosphere and without being the only option on the court often the opposition has to guard (as was frequently the case in atl). raps have another free spot and fans are looking for markeiff morris to add some toughness. 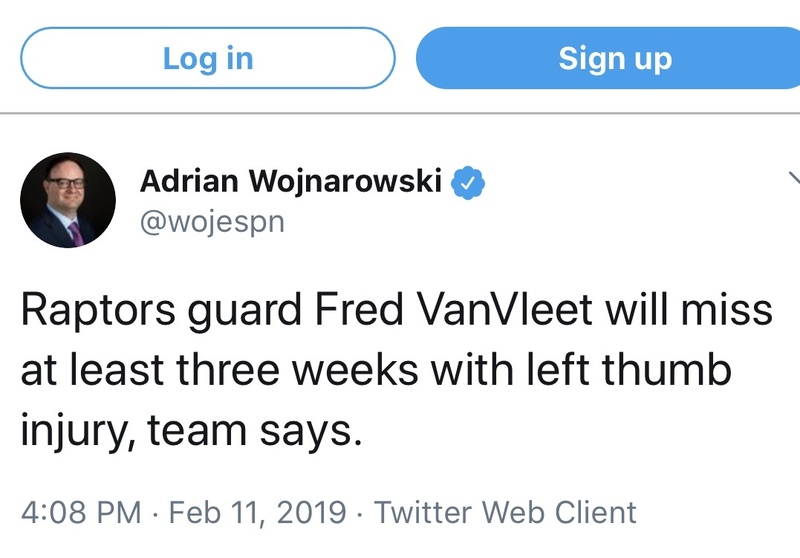 anyway i think lin will often see time with van vleet as second unit. and tho lin will probably still be the 7th to 9th man here he will have a lot more to work with. Marc Kawhi Serge, Lowey, + LIN, Raptors is going to be super good from here on. Go Lin!!!!!!!!!!!!!!!! Yes Toronto is my hometown… Jeremy is coming home !!!! Lin must feel like he just got called out of the G:league to play with a real NBA team. no, i think there is 48 hours waiver period before Lin can play for TOR. I am just wondering whether Lin will be able to play against Wizards. HIGH FIVE HIGH FIVE HIGH FIVE!!!!!!!! GOD WILLING, IT GOT DONE!!!!!! AND A FEW HOURS LATER……YAHOOOOOOOOO! You forgot they just got Marc Gasol too! Finally super team vs super team and a legit chance at a ring! stars aligning unless refs cheat them! 17 will be Linsanity number why not? Hope the coach is fair and will start Lin. Will have to prove himself but starting role should not be out of the question. Baze probably thinking, gosh if not for that 19mil I’d bolt with you too! 🙂 After next year Baze, after next year! Baze is my favorite starting caliber SG/SF to ever play with Lin! So much class, plays hard on both sides and pass to Lin for open shots. I truly wish Lin and Baze can reunite if Toronto gives him an extension! They got a “mentor” for half a season, more than enough! That’s why they have Marc Gasol to hold down the fort! Raptors will be fine! Gasol, Lin, Kawhi, and Ibaka are amazing defenders. Lowry probably the worst defender they have and will lose minutes because of it.